Privet (Ligustrum species) have very strong, fast growing roots and this Privet bonsai is no exception, requiring a regime of root-pruning every Spring to ensure its health and vigour. Unfortunately, due to work commitments, the bonsai wasn't root-pruned during the the Spring of 2009 and by April 2010 it was badly rootbound. Once the rootmass has fully colonized the pot of a bonsai and there is no fresh soil for new roots to grow into, both rootgrowth and top growth slow down considerably and the tree becomes 'stale' and slowly loses its strength.. Slow top (branch/shoot/leaf) growth can be desirable, it does after all mean that the tree requires less trimming and pruning! However, after a few years of being rootbound, a bonsai can lose its health and vigour and needs to be rejuvenated by root pruning before ill-health sets in. During 2009, such is the vigour of the roots on Privet, the roots on my privet bonsai had begun to grow out of the drainholes at the base of the pot in search of space to extend. They had grown to the extent that they formed a matt of roots underneath the pot! So in April 2010, as the new buds began to extend, I rootpruned the tree. The bonsai was levered out of its home revealing a thick mass of roots that had colonized the bottom of the pot. As when repotting any tree, it was necessary to prune the rootmass. 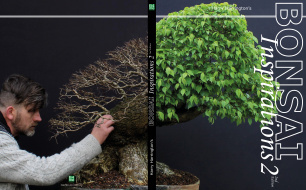 As can be seen in the image above, when the bonsai is first taken out of its pot, it is impossible to see which roots require pruning and which can be left alone. And so the roots were gently teased apart and 'combed' out with a chopstick (I find a wooden tool such as a chopstick allows you much more feedback in your fingers than metal tools do and causes far less accidental damage to the roots) . This can be a very time consuming job, particularly with a rootbound bonsai. There is a fine line between using enough force to pull knotted roots apart and making sure that enough care is taken not too break too many of them! As can be seen in the image above, with the rootmass untangled, it became obvious which were the longest roots and therefore, the roots that required pruning the hardest.